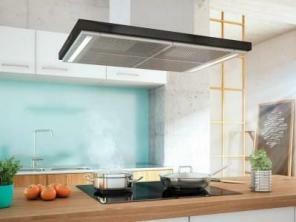 Wide range of hoods including built in, wall mounted, built under and island hoods. In adition of their direct purpose, hoods can become an expressive kitchen interior design detail facinating with high quality materials like inox or inox and glass combinations. 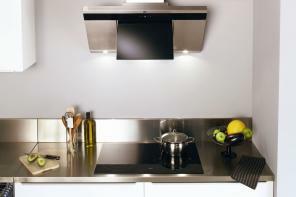 Modern hoods often have very convenient lighting systems which perfectly help while cooking food. Power: hood power depends on the kitchen size. The rule which has to be paid a special attention is that hood should refresh the air from 10 to 20 times an hour. Silent operation: advanced models have special noise insulation and ensure quiter operation of appliances. 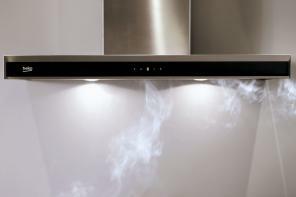 LED and halogen lighting: hoods are designed to illuminate optimally the hob integrated into the worktop under them. The hood lighting is enough for partial kitchen lighting. Unique filter: "Gorenje""AdaptAir" aluminum grease filters are enhanced with a special polyurethane foam that eliminates 98% of all grease particles and other impurities. At the same time, the hood maintains class A absorption efficiency. Brands: "Beko", "Blomberg", "Gorenje", "Jetair".